When we moved from North 4th Street to North 5th Street, all of 3 blocks, we had this wonderful finished basement in our new home. Besides having a good size workshop for Dad, the former owners put in a beautiful bar, tiled the floor, and lined the walls and bar with knotty pine. It was heated, and just a great place for us to play without getting into Mom’s hair. We did our homework down there, entertained friends, and basically just had a good time with a home-made ping-pong table, that doubled for electric trains. There was a TV and hi-fi set eventually wired up with three big speakers around the walls. Mom had a sink, washer and dryer, and her original old Kelvinator refrigerator with its tiny freezer down there; and still there was plenty of room remaining. My job before the big party was to vacuum and clean the floor and then mop it, dust and clean-up the kid stuff, and make it generally neat as a pin. We would then set up little tables for munchies and drinks. Dad would buy one of those big metal cans of Bon Ton potato chips-later using the empty can for parts in his workshop. Before the big party, Dad and I would stop at our favorite soda depot on 6th Street, right where Delavan Avenue tees into it. There we would buy a couple of cases of Brookdale soda. Oh,…. that black cheery was my favorite, along with cream, half and half, and birch beer! We also bought lots of things like pretzels, cheese doodles, paper plates, and drinking cups. 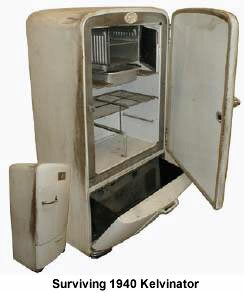 The old Kelvinator was stuffed solid with beer and soda. By the time I got married that Kelvinator was still going strong. Dad had gone through two refrigerators in the upstairs kitchen, but the old faded Kelvinator kept humming. The big treat I always licked my lips over was Mom’s cream puffs and éclairs---all home-made. I could eat a plate and mom knew it, keeping them well out of reach. All that confectionary sugar and the way they would just melt in my mouth. How I would like to feast on those right now with a cup of hot coffee! And she also made those thin dough shapes…. butterflies, stars, Christmas trees, and drizzled them with honey and sprinkled on candy bits. Our sticky fingers would be licked for an hour. By the time Dad got home from work on New Year’s Eve, we had the basement ready to go. He would stop on the way home and pick up some spirits for the celebration, as well as any last minute stuff Mom said she needed. Whiskey Sours, Scotch and Soda, Highballs, Rock & Rye, and some Anisette and Champagne afterwards for the toast. How it all sticks in my mind. Sometimes I would sneak a Whiskey Sour, and give it a couple of sips. As I got older, it started to taste real good! Dad’s trusty 8mm Bell & Howell camera was loaded and ready, and his blinding home-made lighting system was just a foot switch away. He was all set to capture the fun and smiles. Somewhere in my basement are all the old 8mm movies that Dad took over the years. And buried there are rolls of past New Year’s parties. I really must dig them out and take a look back in time. It will be tearful, but I should take another look. We kept watch by the front windows as aunts and uncles and cousins arrived. The cars filled a good part of the whole street. Everyone brought food to complement the salad plates and sliced meats and rolls Mom had been preparing all day. And of course there were always meatballs, baked ziti, sausage, plenty of fresh salads, varieties of eggplant dishes, veal, chicken, and lots and lots of swiss cheese and provolone chunks, pepperoni and salami. Such a feast. I always prayed for leftovers. After dinner, while waiting for the ball to drop in New York City, there was joke telling, the re-living of old family stories, some singing, and most likely a penny poker card game. Penny poker, where even the kids played, was a big favorite after many Holiday meals at our house. Then we had a nice dessert of Italian pastries, fruits and nuts and hot coffee. Somebody else lives in that house on 5th Street now. Mom and Dad, and many of the aunts and uncles are gone. Only memories and echoes of laughter are left. My wife and I go to sleep early on New Year’s Eve. Somehow it’s never been the same since those 5th Street parties. I really need to find those old 8mm movies. That’s the great thing about movies. Everyone looks so real and alive. I wonder who has that old Kelvinator? I know it still works.